Real Betis have named Juan Carlos Garrido as head coach following the sacking of Pepe Mel after a poor start to the season. The Seville-based club have won twice in La Liga and are bottom of the table with only 10 points from 15 matches. 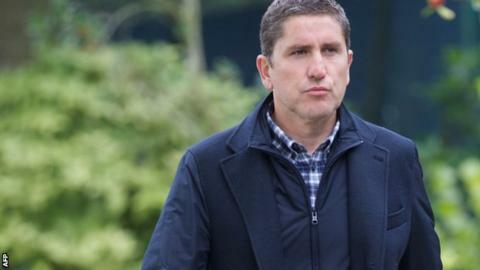 Garrido, who was dismissed by Belgian side Club Bruges in September, has previously managed Villarreal in Spain. Betis finished seventh in La Liga last season, but Mel was sacked after a run of eight domestic games without a win. Villarreal finished fourth and qualified for the Champions League in Garrido's first full season in charge, but the 43-year-old was sacked in December 2011. Former striker Mel, 50, was appointed in 2010 and guided Betis back into La Liga as Segunda Division champions 12 months later. "It is a sad and painful decision with the sole objective of ending the run of poor results that we have been suffering for many weeks," said club president Miguel Guillen. The Spanish club qualified for the last 32 of the Europa League despite a 1-0 defeat at Lyon in Mel's penultimate game in charge. Betis' poor domestic run included a 4-0 defeat by local rivals Sevilla on 24 November.